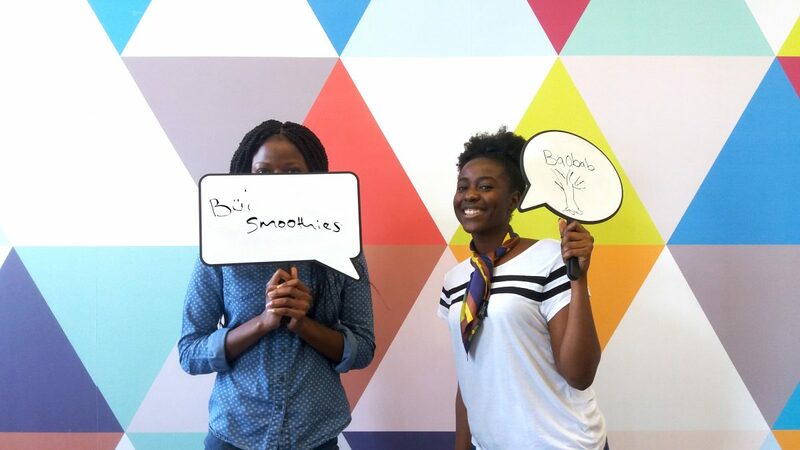 How long have you been working on Bui Smoothies? Was it a spur of the moment idea or had you been thinking about it for a while? Haddy: We thought about something else and then it rolled out to this. Isatou: We’re more of like fitness people – we like going to the gym. So we thought that maybe we should start selling gym foods, since there’s not enough of it that we actually enjoy. But the drinks were sort of an add-on thing that we could give to people and we sort of decided to work on the drinks since the food is too risky. Haddy: and it’s just a lot costlier to do that. Do you think you might eventually move into food? I think we’ll just stay on this path but I don’t know, we’ll see! What caused you to apply for Launchpad? Actually, we came to Accelerator to get advice from Simon and then he told us about Launchpad. Has the programme been beneficial for you so far? Yeah, very! We thought it would just be like “yeah” – just get up and go; but we realised there’s more to a business than just an idea so it’s been very good. What’s been the main take-away for you? Research. Research from talking to people and to develop your product instead of just having a product and trying to sell it to people. Plus, the support you get is really, really good. Do you have a favourite part about starting a company? Isatou: I would say the fact that we even got accepted into Launchpad! I remember when we were applying for it and we were saying “okay we need to leave some time for this thing because Launchpad happens between July and August.” And then I remember Haddy was like “if we get accepted.” “If, if, if.” We finally got accepted and it sort of gave us a little confidence in us as well. What is your advice to a person wanting to start their own business? Get some help. Get a professional because they think of stuff that you wouldn’t even consider. Be willing to learn, be able to take it to heart and be open-minded.